The Sacajawea Hotel offers gracious accommodations in 29 luxury guest rooms, each with flat screen TV, private spa-like bath and telephone. The hotel was named after the famous Shoshone guide woman who led the Lewis & Clark Expedition through the area in 1805. The hotel was founded in 1910 by John Q. Adams (no relation to the former president) to serve passengers and crew of the Milwaukee Railroad. Designed by Bozeman architect Fred Wilson, the wings of the building were originally part of the Madison House, located in Old Town Three Forks. The wings were pulled to their present location on log rollers by horse teams. The balance of the hotel, the lobby and most of the guest rooms, were then constructed. When rail service to Three Forks was discontinued the Sacajawea Inn found itself in the unenviable position of being a railroad hotel without a railroad. Now a wonderful place to base an outdoor trip. Only four miles from the Headwaters of the Missouri River, in the heart of Lewis & Clark's trails. Plenty of hiking, canoeing, trout fishing, hunting, and bike riding. The hotel is listed on the National Register of Historic Places. 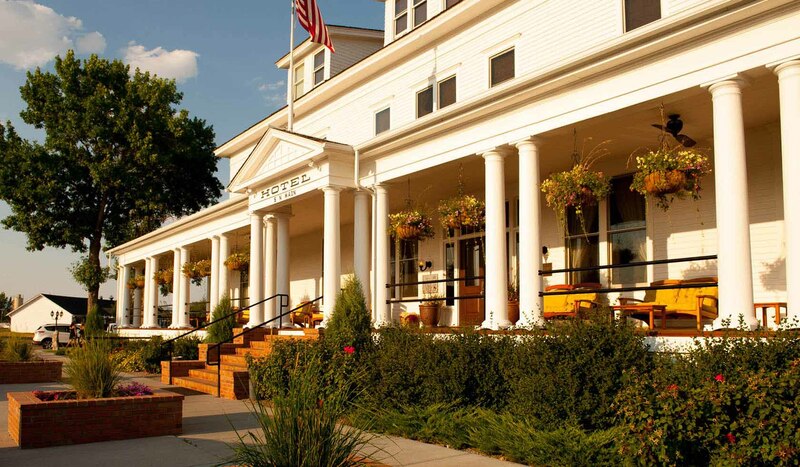 In the spring of 2009 the Sacajawea underwent extensive renovations, providing modern amenities while retaining its old fashioned charms, ambiance and attention to detail. Today the hotel retains all the grandeur of its heyday with luxurious changes. For more information please call. We have three rooms with pets allowed.